Through March 5th-9th, AEF staff members Nancy Zagaya, Vet Tech, and Victoria Howard, Avian Care Specialist, attended the National Wildlife Rehabilitation Association (NWRA) Symposium in St. Louis, Missouri. The theme for the year was Act Local: Fostering Community Connections for Wildlife. We know that the health of wildlife populations are increasingly threatened by anthropogenic changes, from habitat degradation and fragmentation, conflict with domestic animals, to shared infectious diseases. These threats to wildlife health and conservation, which are extensive and appear to grow annually, are both a curse and an opportunity. With the growing One Health initiative and the understanding that the health of animals, humans, and ecosystems are all interconnected, we are better poised to confront today’s wildlife health challenges. In this talk, we consider the Anthropocene, the One Health initiative, and the role that wildlife rehabilitators play in ensuring the health of animals, people, and the planet. Attendees attend a rehab presentation. Lectures on many topics were available at the Symposium. The theme for the year was Act Local: Fostering Community Connections for Wildlife. On Tuesday, Nancy attended a Wound Care and Bandaging seminar led by Dr. Shary Siksay, DVM, on staff at Stone Veterinary Hospital. I had a less educational, more entertainment based day by visiting the St Louis Zoo, and attending the symposium Icebreaker. For the icebreaker, we visited the Arch, and later had dinner on a Mississippi River boat cruise. Enjoying some extra perks while at the symposium! Wednesday was jammed packed with lectures and knowledge to be gained! We started at 8am and the last lecture ended at 9pm. The lectures of the day focused on the one health initiative, largely on welfare, and a few detailed talks from basic diagnostics to avian ophthalmology. There was also a round table discussion with USFWS mainly covering the recent changes to the Migratory Bird Treaty Act. Thursday, we had the privilege to visit and tour the World Bird Sanctuary. In the evening we attended lectures from Carolina Raptor Center’s Dr. David Scott about the use of Tuning Forks in PT and diagnosing West Nile, as well as a lecture learning about enrichment and husbandry for captive corvids. Friday, Nancy spent most of the day in the veterinary lectures, while I spent the day in the education lectures. A few topics Nancy learned about were Outcomes of Raptors with Spinal Trauma and Care of the Emaciated Patient. Meanwhile, I was listening to lectures focusing on educational programs, day camps, and social media outreach. In the afternoon we both attended wonderful lectures focused on training ambassadors, presented by trainers from numerous incredible facilities like World Bird Sanctuary and Tracy Aviary, all focused on choice for the bird and increasing welfare. The final day we attended raptor centered lectures with topics ranging from renesting to mew design. Somehow between all the learning and lectures, we made time to network and meet SO many incredible people from incredible facilities. It was an invaluable experience and I hope to share as much as I can with fellow co workers to continue to better and grow AEF. 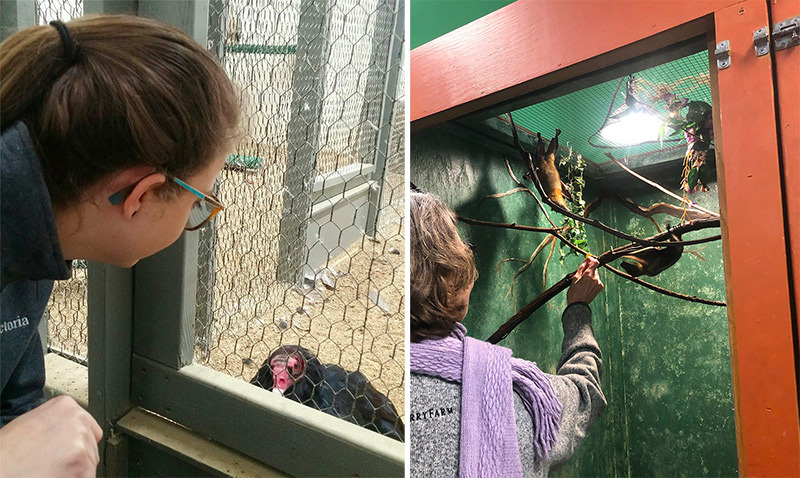 L-R: Meeting Turk the vulture (sister to AEF’s George) and observing an exhibit of Fruit Bats at the World Bird Sanctuary. 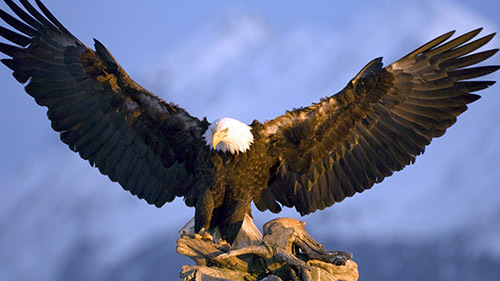 Support American Eagle Foundation Help save and protect our nation's majestic eagles. The American Eagle Foundation (AEF) is a 501(c)(3) non-profit organization. Contributions to the American Eagle Foundation are tax-deductible to the extent permitted by law. The AEF's tax identification number is 58-1652023.